Really. That is a direct quote. I probably won’t be selling her a kitchen. I will have to tell the Allmilmö story sometime. Published on November 22, 2015 in Old Posts about Customers and WTF?. Closed Tags: Elitism, We are so Fucked. Are in my experience, a crock. Dr. Joy Bliss at Maggie’s Farm has an interesting post up pointing to an article about a woman in Sweden who claims to be allergice to electricity. She also has a few words to say on Multiple Chemical Sensitivities. The Multiple Chemical Sensitivity people, in my experience, have symptoms according to the situation they are in: if it costs someone else money (government, insurance carriers, etc.) they have the symptoms really bad; if it costs them money, the symptoms are not as severe. When I had my kitchen design studio they would come in once in a while. They would ask about formaldehyde free plywood and particle board. They would ask about low/no volatile organic compound finishes. I would assure them I could do the work. I would assure them I could provide them with certifications by independent organizations that my materials would be provided as claimed. They would get all excited until they found out the premium I had to charge in order to meet their job specifications. They didn’t want to understand that using material that is different from the material 99% of other people use is more expensive. They would then claim that “so and so” did not charge a premium and disappear. I know the reality is that I educated them on the processes and materials and they then went to someone else that used typical materials after I presented my price. I often felt sorry for the spouses (I should say husbands. In my eperience it is only women that suffer from chemical sensitivites). The sensitive one would come in for a few minutes, claim that there was something in my showroom that was bothering them and then go outside. They would leave their spouse shuttling between me and them, as though the spouse were some sort of unpaid negotiator. I always found this to be odd treatment of the partner. I think the shrinks have a phrase to describe this type of behavior. Stolen, without any shame, from The Doghouse Diaries. I do find myself getting frustrated with people that use wood species as names for color. I guess that is a frame of reference that I just have never developed. Naturally, I like to think of the words I use for color as more precise, but I know that enough people use Pecan as a color name that it must exist. 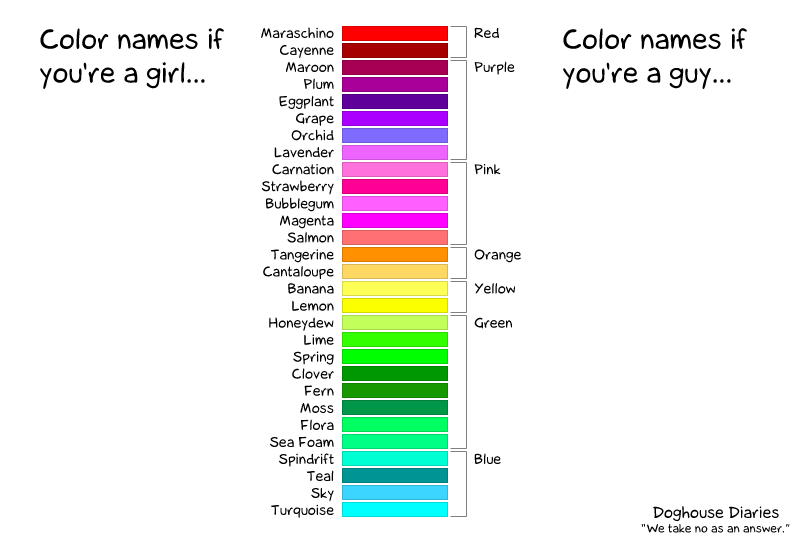 Walnut and cherry are colors too, in case you were wondering. First in an occassional series. Well maybe the third or fourth if you count my first effort at starting a blog; which I managed to blow up. This post is inspired by a comment I left at Bob Borson’s blog. A while back, in another kitchen universe, I had a couple come in my showroom. Her parents were junk dealers when she was young. She said she wanted a new kitchen that reminded her of the home of her youth. We produced a layout that was very common/mundane. It fit perfectly with the home. But where we met her stated design goal was to use two cabinet brands with three different door styles and finishes. We used two different countertop materials. Finally, the hardware was different on all of the cabinets, none of it matched. Has to be one of the ugliest kitchens any one has paid money for. You won’t see it in my portfolio. In case you were wondering, since I’m still writing for and to myself at this point in the life of my blog, I have high confidence my customer will never see this post. Another prospect. This woman works for a large brewery. The King of all breweries. She is obligated to buy a kitchen from me, right? I mean, really, if there is such a thing as turnabout being fair play. Nice enough guy. Stops in the showroom the other day. Says he is putting a contract in on the purchase of a house in the neighborhood. The house needs a new kitchen. I don’t get too excited as I have heard this story many times. Most purchasers stretch financially (yes, even today they still stretch financially) to acquire a new home. Of those that want to put a new kitchen in their new home, few will have the remaining budget to do so. All of their money will have to go toward the purchase. Once the home is purchased, there will not likely be enough money for a new coat of paint, let alone a new kitchen. So as I talk to the fellow, I provide information on what it is we do, but I am also qualifying him as a prospect. I am trying to figure out just how likely we are going to be able to provide this gentleman with a new kitchen. I want to sell him a new kitchen, as that is how I make my living. But, and this is a big but, I don’t want to waste time on someone who will not buy a kitchen, or prove himself to be a less than desirable client. What follows for those of you wanting a new kitchen is an example of how not to open negotiations with a kitchen dealer. Mr. Prospect starts by saying all the types of things I like to hear. He is giving me clues as to his ability to pay for a new kitchen and everything he says is music to my ears. But then we get to a real discordant note. He tells me that since there are lots of people out of work he thinks he can’t get some real good pricing. He thinks he can hire guys through craigslist to do his work. Thinks he can save a ton of money doing so. He wants to know if our business is good. He’s trying to find if we are amenable to providing a good deal. I start to lose interest. I hope it wasn’t too obvious. I don’t want people to find me rude. I also do want to sell a kitchen, it’s how I make my living. But I am left wondering what goes through a guy’s brain when he’s telling me up front that he doesn’t want me to be able to make money on his deal. Does he think that will make me interested in working with him? Really? It takes a good deal of money to keep a large showroom like Redstone’s open each month. If business were bad, where does this guy think the money comes from to pay the overhead. One thing that is particularly sticky about prices in a recession is overhead. The phone company, the electric company, the landlord, etc. do not reduce their prices. If business were slow the only place the money could come from to keep the doors open is from the pockets of the owner, and to a lesser extent, the pockets of commissioned salespeople. A guy that is as apparently successful as my prospective client realizes this about his own business, why can’t he realize the same about ours? If I’m not going to be given the opportunity to make money, I can stay home and watch Oprah. I can write a rambling blog post. I can do many things that are easy and more enjoyable than working for a client for free. And, in addition to working for free, why would I want to take on the risks associated with installing a new kitchen in someone’s home? Those risks that can end up costing me real money. So if you are in the market for a new kitchen, let me give you a bit of advice: you want your kitchen dealer to make money. You want your kitchen dealer to look forward to working with you and providing you good service and they way to get that good service is by providing the incentive of a profitable job. I am not suggesting you be a spendthrift and not husband your own resources wisely, but rather, that you be aware of how to get good work done in your home. If you beat all the profit out of your kitchen project you will be one of those that tells the stories about the awful and unprofessional people in the remodeling business. Oh, and good luck with hiring trades on craigslist. Building and remodeling have slowed down. Building and remodeling have not stopped. The trades that show up on time ready to work in a professional manner are not sitting around hammering the reload button on craigslist, they are doing work for people that recognize good value and a fair deal.